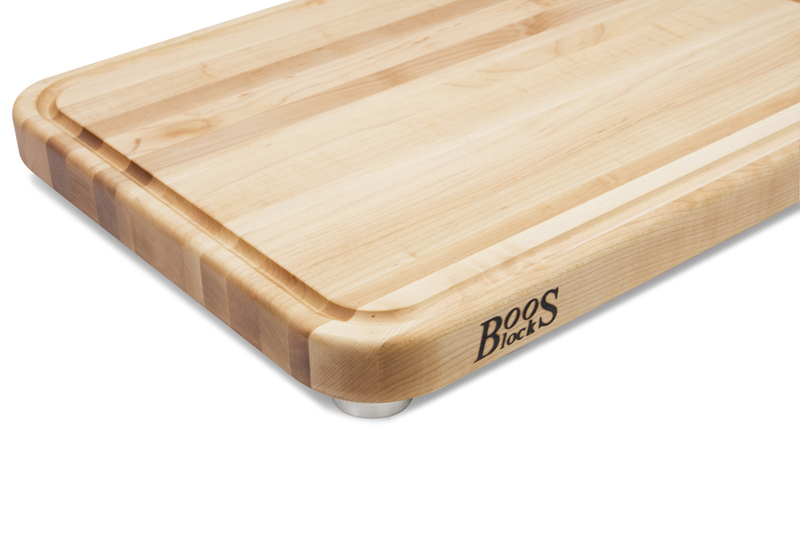 If you're looking for a cutting board with a juice or gravy groove - typically a half-inch-wide sluice along the board’s perimeter, typically carved within about an inch from the board's edge - you'll find many varieties to choose from. An improvement on this basic design is a juice-grooved carving board with a pouring spout. Essentially, the trough that runs along the edge of the board is extended all the way to the board’s edge in at least one corner. Slowly tilt the board so that the flavorful juice remaining from your carved meat, or chopped vegetables or sliced fruit is channeled toward the built-in spout. Position the spout above your target and pour. It's that simple. Meat grippers come in a variety of styles and designs. The most basic is a curved indentation into which a chicken or turkey, for instance, can be positioned. The simplest law of physics – gravity – takes over from there. The mass and weight of the meat generally is sufficient to keep it in place for easy handling, however it is still subject to some slipping and sliding around, especially as its mass lessens throughout the meat carving process. As you might imagine, there are carving boards designed to lessen the likelihood of a roast slipping and sliding. One approach is build protruding grippers right into the surface of the board. A popular design device is a grid of miniature pyramids sculpted into the board’s surface. The resulting array of mini pyramids leverages other principles of physics, namely friction and force, to benefit wannabe professional chefs, as well as authentic pros. Each pyramid acts as a contoured wooden spike that ever so slightly pierces the surface of the meat. 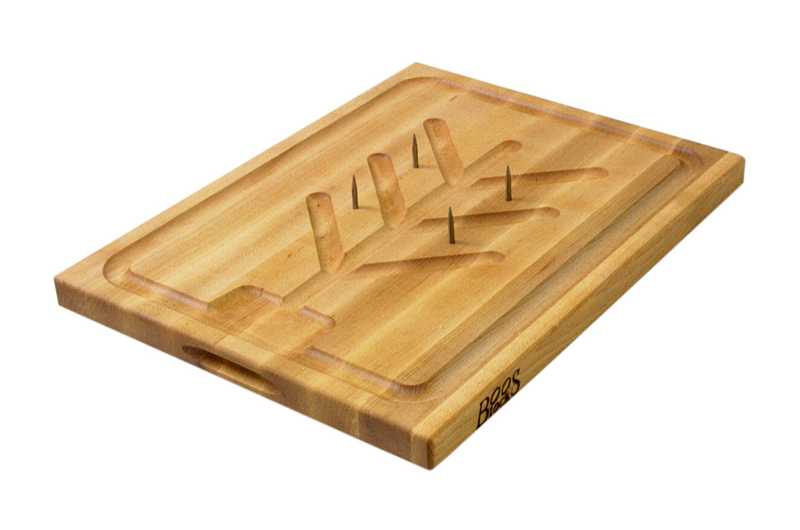 The most surefire design for holding a roast or other large piece of meat firmly in place incorporates wooden or metal spikes one to two inches long, that protrude from the surface of the board. Whatever it is you’re carving, it’s almost guaranteed not to slip or slide once dropped onto these spikes. 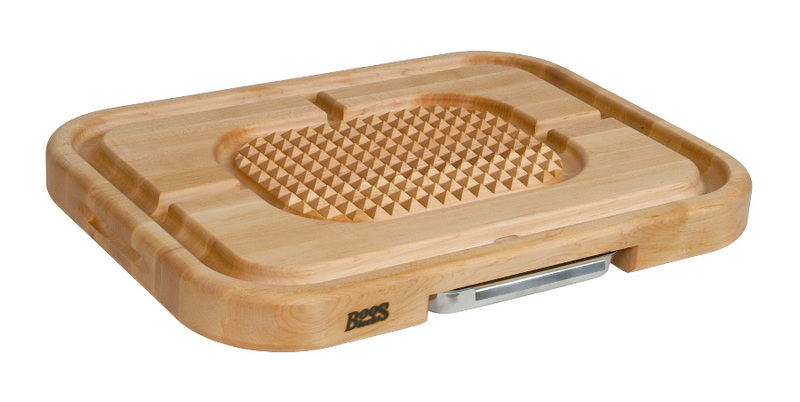 You might want to check out our full assortment of chopping blocks. 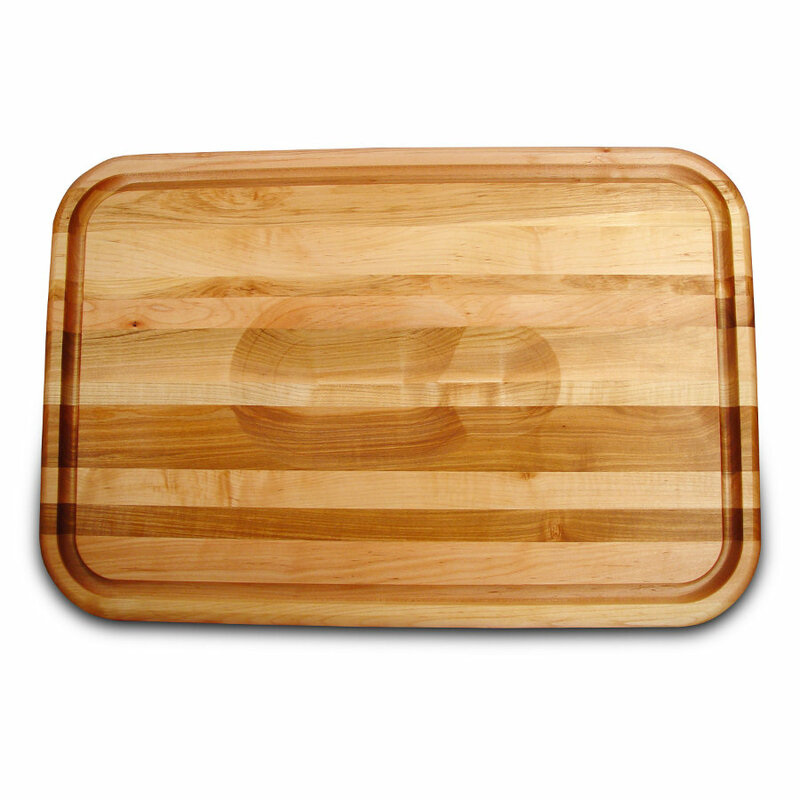 Or view our entire catalog of cutting boards.